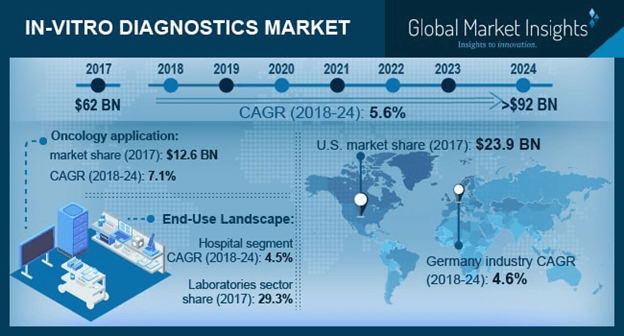 In-vitro diagnostics Market size is set to exceed USD 92 billion by 2024; according to a new research report by Global Market Insights. Rising adoption rate of automated laboratory equipment and machines will boost IVD market growth over the coming years. Developed countries such as Germany and UK have progressed well in adoption of advanced technology enabling modifications in the medical diagnostic equipment and machinery. Growing implementation of technologically advanced diagnosis equipment should foster business growth. Increased accuracy offered by diagnostic devices will improve performance of surgical procedures enhancing in-vitro diagnostics industry growth in upcoming years. Growing preference of elderly population towards personalized medicines for treatment of numerous chronic disorders will propel the market growth over forecast timeframe. Extended use of in-vitro diagnosis devices to develop novel therapies that treat disorder at molecular level will accelerate industry growth. More than 22 million people in Germany are in age group of 60-80 years and majority of them suffer from at least one chronic disorder that will upsurge the demand for in-vitro diagnosis. Increase in the number of pathology laboratories globally will influence the industry growth positively. Pathology labs are well equipped with technologically advanced diagnostic devices increasing preference amongst the geriatric population. Also, availability of skilled technicians in-vitro diagnostic laboratories should augment industry growth. In U.S., around 18,000 pathologists are actively practicing and around 93% of them are board certified escalating the business growth in forth coming years. However, industry growth is hampered by the high cost associated with the diagnostic procedures. High costs of the diagnostic procedures will act as a major restraint affecting industry growth by creating affordability issues. Reagents & kits segment accounted for highest market share in 2017 and is anticipated to grow at 6.6% over the coming years. Extensive use of reagents in the diagnostic services utilizing devices such as PCR and others will favor the demand for reagents and kits. Moreover, escalating R&D activities initiated to treat the genetic disorders will also enhance segmental growth in the upcoming years. Services segment of service type held USD 34.8 billion in 2017 as a result of rise in disorders caused due to nicotine addiction. High incidences of lung cancer in UK alone has created a hike in the demand for accurate diagnostic services. In UK, 13.1% of the total cancer registrations account to lung cancer that will escalate in-vitro diagnostics industry growth over the forecast timeframe. Clinical chemistry segment held revenue share of 20.9% in 2017. Extensive applications of clinical chemistry should boost business growth over the forecast timeframe. For instance, use of clinical chemistry to develop novel therapies that eradicate the gene-level diseases such as Huntington’s disease, sickle cell anemia and cystic fibrosis that will enhance the segmental growth. Oncology segment should grow considerably at 7.1% CAGR over the forecast timeline owing to rising prevalence of cancer globally. In UK alone, there are around 360,000 people diagnosed with cancer annually that will augment the demand for in-vitro molecular diagnostic services in upcoming years thereby stimulating segmental growth. Laboratories segment of IVD market accounted for 29.3% revenue share due to increasing number of well-equipped laboratories that deliver superior quality diagnostic services to the patients. Integration of advanced technology within the diagnostic devices have enabled accurate diagnostic decisions that have improved the surgical performance stimulating the segmental growth. U.S. market held an enormous regional share of 89.7% in 2017 and will have similar growth trends in the near future. Growing burden of chronic diseases and viral infections have surged the demand for in-vitro diagnostic procedures. In U.S., around 3.9 million people are infected with hepatitis C that establishes a strong demand for advanced diagnostic devices to sustain the health of patients. Germany market should grow at 4.6% during the forecast period owing to increasing technological advancements that have added improvisations in the existing in-vitro diagnostic devices. Furthermore, ageing demographic condition in Germany will have a positive impact on industry in foreseeable future. The geriatric population of Germany in 2017 was around 22 million that should positively influence in-vitro diagnostic market growth. Some of the prominent industry players operating in the in-vitro diagnostics industry are Abbott, Becton Dickinson, BioRad, BioMerieux, Cephied, Danaher, Grifols, Johnson & Johnson, Luminex, Roche Diagnostics, Siemens, Sorin, Thermo Fisher and Qiagen. Key industry players focus on strategic initiatives to improve their market position. Strategic initiatives adopted by major companies include mergers, acquisitions and new product launch that fetch them sustainable profits. For instance, in March 2018, Danaher acquired Integrated DNA Technologies. This acquisition will expand the company’s product portfolio and aid revenue generation for the company.